The Miami Valley Jr. Champs uses electronic punching (e-punching) at many events. With e-punching we can print a complete result sheet including splits between controls immediately after finishing. This involves some additional equipment and hence the $2 fee if you need to rent an SI-card (a.k.a. electronic punch card, e-card, or finger stick). If a rental SI-card is lost, the replacement fee is $40 per card. 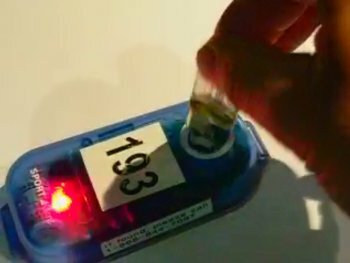 Clear out old data on the card using the "Clear" station - Put the end of the stick in the hole and hold it there until you hear a beep and/or see a light flash on the station. Only one beep is needed. Check that the card is ready - Put the stick in the "Check" station. You should hear a beep and/or see a flash immediately. Again, only one beep is needed. Start your course - Put the stick in the "Start" station. The start station should beep and flash. Your start time is now recorded on your card. Remember, only one beep is needed. Visit all your controls and 'punch' each station using the card. When you 'punch', the control number and time of day is recorded on the card. How many beeps are needed? That's right, only one. Punch the finish control. This records your finish time on the card. Did you hear the single beep? Download your card data at the result area - Put the stick in the "Download Station" and hold it there until it beeps. Then get your result sheet from the printer. If you rented the SI-card, put it in the SI-card Return Box. Take all the controls in order. The result processing software checks that all controls are punched in the correct time order. If you realize you missed a control, go back to it, punch it, and then punch all controls after it in the correct order. You may have to re-visit controls to do this. If you happen to punch an extra control not on your course, ignore it and go on. The software ignores superfluous punches. If someone is following you and you don't want to lead them to all the controls, punch an extra control on your way if you happen to see one. If the follower is paying any attention, they'll know you punched a control not on their course. They'll wonder if you're doing a different course and leading them astray! FYI, MVOC rental SI-cards hold 30 punches (in addition to clear, check, start, & finish). If a control unit doesn't beep or flash, punch your map with the manual pin punch attached to the control stand. Tell the results crew you did this when you return and show them the manual punch. MVOC controls are always run in standby mode, so if they haven't been punched in a while, they turn off. Turning them back on and registering a punch takes an additional half second when a finger stick is inserted. The difference in punch time is slight and battery power is conserved. The first runner on a course may wake up several controls. 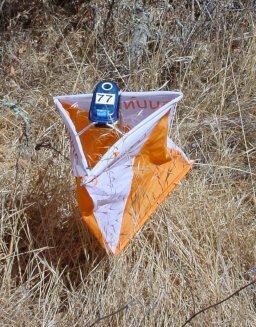 If you want to purchase your own SI-card, please visit the US Orienteering Federation's vendor page and check out some of their offerings. The SportIdent (SI) system used by MVOC is the main e-punch system in the US, Europe, Australia, etc. An SI-card purchase is worthwhile if you plan to orienteer in the future, here or anywhere. A Rental SI-Card Agreement must be signed for use of a rental SI-card. This agreement includes the waiver, and registration time can be saved if you download and bring a filled out copy to the event. If you are a coach registering multiple participants, there is also a Coach Team Planner spreadsheet to help you organize your teams for the Miami Valley Jr. Championship competition. If you're bring a lot of people, it's a good idea to e-mail the event director and let them know how many groups will be running what courses. Thanks. A lot of data can be gleaned from the e-punching system. Preliminary results will be available the day of the event. After the event detailed e-punch data will be posted on the MVOC web site. Here is an example of available data. It contains the time-of-day down to the second that each control is visited for each SI-card. For competitions involving trophies, if during the event a competitor or coach files an official protest of collusion by a team to the meet director, and subsequent chip data indicates following (Winsplits Packrunning Index =>60%), the protest will be upheld and the competitors involved disqualified. The extra information possible with e-punching is designed for you to analyze your orienteering experience more objectively. With the split data a host of useful information can be obtained such as time behind the course leader, time behind the fastest split for that leg, position during each leg, consistency from leg to leg, etc. These can be presented in both tabular and chart form. The WinSplits program that MVOC uses to analyze split data can do this and more. One really cool thing it does is show figures running across the screen to simulate all runners on a course. Ask me to show it to you the next time we use e-punching.